In fairy tale the king and queen are invariably equal. They go together. In both Snow White and Sleeping Beauty the king and queen long for a child together. They rejoice together at her birth. And together they form one spiritual whole and social authority that prospers the land and its people. This spiritual configuration is Hermetic; where equal and opposite pillars hold up the tree of life together. If they are not together the kingdom, and its daughter, suffers. When the king and queen do not exist together we have, as a basic condition, the orphaned state of the Beauty tales. Specifically, a motherless daughter. The queen as nurturing mother is absent. In her place the Step Mother appears. Both Snow White and Cinderella show her as a wicked and resentful adversary, who would kill or utterly subjugate the daughter of our story. The Church has been such a mother to Beauty. Beauty, who was at the absolute center of the spiritual life of our ancestors became, by the time of Pope Gregory, a mere prostitute… as part of the campaign to cut Her completely out of the picture. The Church, as such a malevolent mother, is depicted in the Beauty tales as the Step Mother. In Da Vinci’s Last Supper Peter, as the so called rock of the church, represents Step Mother Church. Peters actions in the painting show the actions of Church dogma: He holds one hand to John’s throat. The other hand, behind his back, holds a knife. In the quote above the speaker does not claim to be a mother, but steps in only as a mother. The peculiar result of replacing the divine mother with a male version is depicted in an odd portrait, painted during the Renaissance period. The name given to the painting below is simply a Jewish Couple. 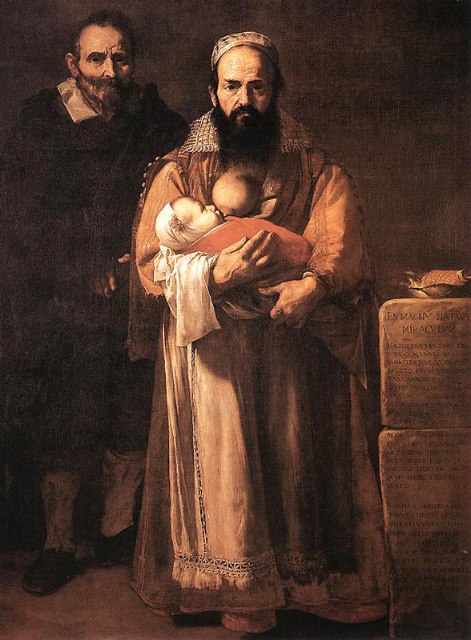 The image of two bearded men, as a couple, is perhaps not so peculiar, but the fact that one is holding a perplexed infant up to his uni-breast seems, at the very least, strange. Is this not the spiritual situation in western culture? Our fairy tales suggest that we are orphaned of our heavenly mother. The exclusively male mother church offers a single breast. At one point in the play Faust asks Mephistopheles ; Is this such food as fails to feed? Could such a singular parent provide true balanced nutrition?